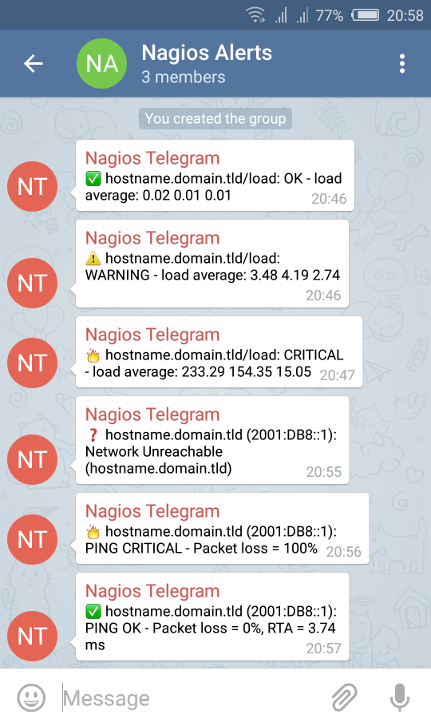 This post shows you how to use Telegram for Nagios notifications. First create a Telegram Bot by talking to the BotFather. The Telegram Bot will be the sender of the Nagios alerts. command_line     /usr/local/bin/telegram_nagios.py --token 200194008:AAEG6djWC9FENEZaVIo3y3vZm24P3GTMetw --object_type host --contact "$CONTACTPAGER$" --notificationtype "$NOTIFICATIONTYPE$" --hoststate "$HOSTSTATE$" --hostname "$HOSTNAME$" --hostaddress "$HOSTADDRESS$" --output "$HOSTOUTPUT$"
command_line     /usr/local/bin/telegram_nagios.py --token 200194008:AAEG6djWC9FENEZaVIo3y3vZm24P3GTMetw --object_type service --contact "$CONTACTPAGER$" --notificationtype "$NOTIFICATIONTYPE$" --servicestate "$SERVICESTATE$" --hostname "$HOSTNAME$" --servicedesc "$SERVICEDESC$" --output "$SERVICEOUTPUT$"
The Telegram Nagios plugin is able to send alerts to a single contact or to a group chat. As you can see Telegram GroupIDs are negative numbers. How to get your UserID or GroupID? Download and install this Telegram CLI: https://github.com/vysheng/tg. The CLI makes it easier to discover your UserID and GroupIDs. There is your UserID (#12345678). 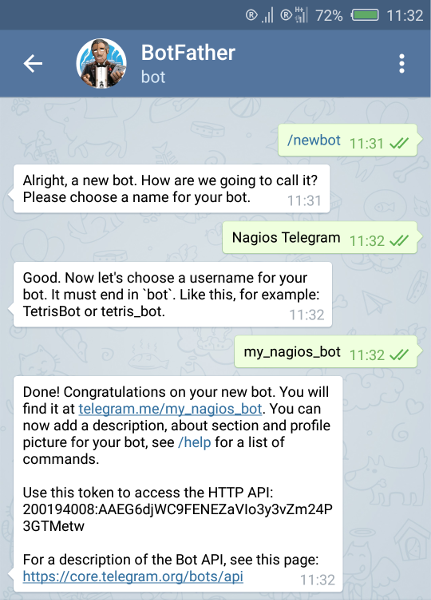 First start a conversation with the Bot you just created to be able to receive messages (Nagios alerts) from the Bot and to be able to invite it to a Telegram group chat. To receive Nagios alerts in a Telegram group chat, create a group chat and invite the Bot. You need at least 2 other users in the group. There is the GroupID (id 23456789) of the Nagios Alerts group chat which needs to be configured in the Nagios configuration as a negative number (-23456789). Let’s send some test messages! telegram_nagios.py --token 200194008:AAEG6djWC9FENEZaVIo3y3vZm24P3GTMetw --object_type service --contact "-23456789" --servicestate "OK" --hostname "hostname.domain.tld" --servicedesc "load" --output "OK - load average: 0.02 0.01 0.01"
telegram_nagios.py --token 200194008:AAEG6djWC9FENEZaVIo3y3vZm24P3GTMetw --object_type service --contact "-23456789" --servicestate "WARNING" --hostname "hostname.domain.tld" --servicedesc "load" --output "WARNING - load average: 3.48 4.19 2.74"
telegram_nagios.py --token 200194008:AAEG6djWC9FENEZaVIo3y3vZm24P3GTMetw --object_type service --contact "-23456789" --servicestate "CRITICAL" --hostname "hostname.domain.tld" --servicedesc "load" --output "CRITICAL - load average: 233.29 154.35 15.05"
telegram_nagios.py --token 200194008:AAEG6djWC9FENEZaVIo3y3vZm24P3GTMetw --object_type host --contact "-23456789" --hoststate "UNREACHABLE" --hostname "hostname.domain.tld" --hostaddress "2001:DB8::1" --output "Network Unreachable (hostname.domain.tld)"
telegram_nagios.py --token 200194008:AAEG6djWC9FENEZaVIo3y3vZm24P3GTMetw --object_type host --contact "-23456789" --hoststate "DOWN" --hostname "hostname.domain.tld" --hostaddress "2001:DB8::1" --output "PING CRITICAL - Packet loss = 100%"
This entry was posted in Linux on March 24, 2016 by pommi. Hi , if this codes still working at nagios xi? or anyone kindly help to intergrate nagios xi to telegram. command_line /usr/local/bin/telegram_nagios.py --token 200194008:AAEG6djWC9FENEZaVIo3y3vZm24P3GTMetw --object_type host --contact "$CONTACTPAGER$" --notificationtype "$NOTIFICATIONTYPE$" --hoststate "$HOSTSTATE$" --hostname "$HOSTNAME$" --hostaddress "$HOSTADDRESS$" --output "$HOSTOUTPUT$"
@John: I’m sorry. I don’t know about Nagios XI. @Robert: Did you set the “pager” for the contact correctly in your Nagios config and did you reload Nagios afterwards? Can you show more lines of what your are doing when you say “I get in the telegram the hostname of my server” (I do not completely understand what is happening here)? I set the pager in contact and did restart the nagios service. I’m getting the code that is in command.cfg in nagios and testing manually. /usr/local/bin/nagios_telegram.py --token 200194008:AAEG6djWC9FENEZaVIo3y3vZm24P3GTMetw --object_type host --contact "$CONTACTPAGER$" --notificationtype "$NOTIFICATIONTYPE$" --hoststate "$HOSTSTATE$" --hostname "$HOSTNAME$" --hostaddress "$HOSTADDRESS$" --output "$HOSTOUTPUT$"
linux01 is the hostname of my server. This worked great! Thank you for the tutorial. I worked Telegram into a Docker Compose project for monitoring my services. Hi Robert, Thanks for your explanation. When testing from the shell you need to replace all the “$VALUES$”. The “$VALUE$” is there for nagios to replace it by actual content. You can see examples in my blog post, how to send test messages. The reason you get “linux01 $ ($): $”, is because your shell interprets all things starting with a $-sign as environment variables. For example “$HOSTADDRESS”, which is empty so you get “$” (“$HOSTADDRESS$” minus “$HOSTADDRESS”). P.S. You might want to “/revoke” the API key you just published in your comment. 😉 I replaced it with the example from the blog post. Any way to make this working? nagios_telegram.py requires twx.botapi, a Telegram Bot API client python library. You need to install that. I installed all the pre requisites ans execute the scipt to test the send, but i did not give any error. How can i troubleshoot it to debug it ? What looks strange in your case is the – – contact option. It shouldn’t start with a +, it’s not a phone number. It is a Telegram GroupID or UserID. When using a UserID make sure you first start a conversation with your bot first. A bot cannot initiate a conversation to prevent spam on Telegram. First Thank you to Fix my Error 🙂 I really forget to clear it when i post it. Thank you Again. For the other hand i will test to change the phone number and put your recommendation. Thanks for this bot! It’s great! Hello. I’m running into an issue where when Nagios wants to send a notification I get an “ImportError: No module named twx.botapi” error. But when I send a test message I receive it with no problem. I cant make it work. What am I doing wrong? Hi Nicolas, that means that the twx.botapi python library is not available for the nagios user. Did you install the twx.botapi python library system wide? Could you tell what is the problem or missing module ? After this, you will maybe have the same problem as I’m having. Im triying to install it on a CentoOS7 server that i use to monitorize vm-machines, can anyone explain me how i install the twx.botapi here, i can’t find the way and i have all already configured. I try to followed the installation progress and seem everything is fine. But when i tried to send test message, I don’t receive it on my telegram group chat. Anyone suggestion please !!!!! How to get the nice notifications with emojis? @Thorsten: It’s part of telegram_nagios.py. Emoji are just unicode characters. why the output that appears like this $ ($): $$. and why notification alert only to the service, not on host? 1. Add the Telegram BOT to the group/chat. 2. Send him a any message. This is a sample of the response when you add your BOT into a group. Use the “id” of the “chat” object to send your messages. Thanks for this. After a little bit of fiddling, and figuring out how to install twx.botapi, I have this working on CentOS 7.5. How/where can I remove the ‘/’ that is just before ‘Chrome’? P.S. for those struggling with twx.botapi this is how I got it working on my CentOS install. You will have to adapt for your OS. I proceed configuration of this tool this morning at RedHat 7.3 Enterprise Linux. I had one issue with the configuration so I would like to share them with you. I was searching for something useful to integrate IM into the process of monitoring our environment. @pommi Thank you very much for this article and for python script as well. You are amazing. Hello Everyone. Please, i search examples files host.cfg and service.cfg. How to add notify-host-by-telegram and notify-service-by-telegram that files. i need add commad event_handler notify-host-by-telegram ??? Please help me.